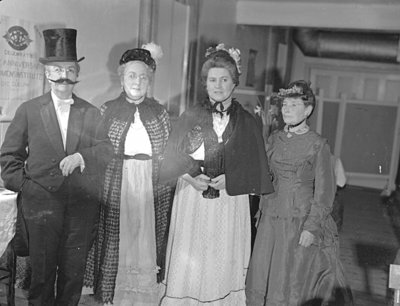 Black and white negative showing a group of women dressed in costumes at the celebrations for the 37th anniversary of the Brooklin Women's Institute. From left to right: Mrs. M. Richardson, Mrs. Norman J. White, Mrs. Mabel Heron, Miss Louella Mowbray. This photo was printed along with an article on page 5 of the February 27, 1947 issue of "The Daily Times Gazette". 37th Anniversary of Brooklin Women's Institute, 1947, Marjorie Ruddy. Whitby Archives, A2013_040_1274.